West Norfolk is not generally East Anglia's most beautiful area, but there can be few more lovely spots than this churchyard overlooking the village in the valley below. The First World War memorial stands like a sentinel, and in the field beneath there are medieval earthworks which stretch away towards the village street. There is a sense of continuity, and on the heat of this day in high summer there was a gentle haze, the drone of an itinerant bee and the occasional flick and swish of a tail from the lazy cattle on the other side of the wall. The names on the memorial seem far too many for such a small, remote parish, and are a reminder of the extent to which that conflict affected the poor rural people of Norfolk, and left the county changed forever. I sat on the base of the memorial, my back to the church, thinking about the hundreds of men of west Norfolk who had been lost at Gallipoli, all so many on the same day, even the same hour. Parish churches provide a continuity down the centuries, down the long generations; but they are also touchstones to a more recent and more haunting past. When I was a child there were still many men alive who had fought in the trenches of the Western Front. Men who had fought on the Somme and at Passchendaele, in the Dardanelles and the Middle East, were then in their late seventies, and were set apart. People did not talk about the War when I was child, and so few of these men were ever able to share and heal their memories. As I grew older, so a general interest in the War and the experience of it for ordinary soldiers grew; but those men, boys really, who had fought in it were dying out. A few weeks after I sat here on this beautiful lonely hillside, Harry Patch and Henry Allingham, the last two British survivors of the conflict, were both dead. I think now of my great-grandfather and my great-great-uncle, who were both killed in the Battle of the Somme. My Great-Great-Uncle Harry was one of the very first to die on the very first day of the Somme. He was a private soldier in the 11th Suffolks, the renowned Cambridge Battallion, who went over the top at 7.32am on that beautiful summer morning along with the Grimsby Chums, at at a place known as Sausage Valley, just south of La Boisselle, to the east of the town of Albert. Malcolm Brown, in the Imperial War Museum Book of the Somme, records that ...within two minutes of zero hour, before they had cleared the front trench, they had been raked by machine-gun fire. The Lincolnshires lost 15 officers and 462 other ranks, the Suffolk battalion 15 officers and 512 other ranks. An artillery officer who walked the ground later found 'line after line of dead men lying where they had fallen'. On the war memorial in the tiny village on the outskirts of Cambridge where he was born, my great-great-uncle's is the first name. But there are eleven other names on the memorial in that parish of fewer than a hundred people, and three of them were also killed in the same attack. How dreadful it must have been when the news reached the village one morning in the early days of July 1916. He was nineteen years old. My mother's side of the family was forever shadowed by the pain and grief of losing him, and every name on the Shouldham war memorial must have been the catalyst of a similar pain, a similar grief. I would have liked to have wandered into the numinous interior of All Saints church to contemplate further; but this church is kept locked, and there is no keyholder notice. 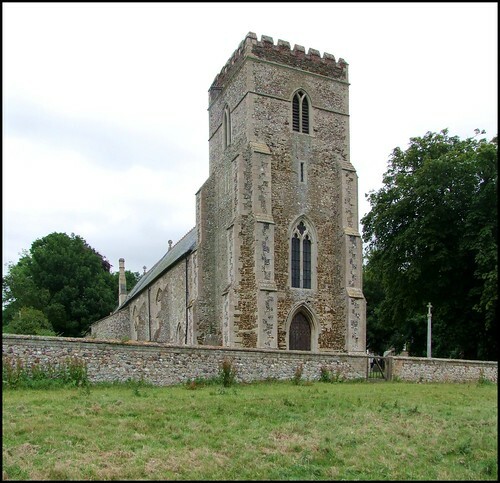 I have spoken to several other Norfolk church explorers, and none of them has ever seen the inside of Shouldham church. And so, it is a dying church, I suppose; for what use is a church if it is only there for the Sunday club? As for the exterior, it is grand, the combination of 14th Century Catholic piety and 19th Century Anglican triumphalism. The use of carstone in the tower makes it seem even more substantial, and the chancel is all of its 1870s rebuilding. I suppose that there are things of interest inside. I thought again of the names of the boys on the war memorial overlooking the village - it must be visible from many of the houses. I thought of the comfort that the church might have offered the families of the dead, if only to heal their grief and give them a sense that there is more to life than the merely visible. The Church of England was reaching the point of its highest influence at the time of the First World War; but it would wane, and is waning still today, the denomination becoming a shadow of its former self, at least in terms of its power and influence. However, it seems that it is increasingly aware of its mission to non-churchgoers, to the pilgrim and the stranger, to the local community. Perhaps not in Shouldham, though. As so often, I thought of Larkin, and wondered who will be the last, the very last, to seek this place for what it was? Larkin was an agnostic, of course, but I think there is a real optimism in his final conclusion that someone will forever be surprising a hunger in himself to be more serious, and gravitating with it to this ground, which, he once heard, was proper to grow wise in, if only that so many dead lie round.